Doctor Who: The Moffat Scripts - A GOOD MAN GOES TO WAR | Warped Factor - Words in the Key of Geek. Dr. Moo writes a mostly-positive review of A Good Man Goes To War (aka: A Good Man Goes Goes to an Annoyingly Long Title). Mid-season finales are a very unusual concept to British viewers as few of our shows inflict such horrible practises upon us. Yet for some obscure reason the BBC decided that series six of Doctor Who was going to be split down the middle, and so Steven Moffat had to work one into the series structure. What we got as a result was A Good Man Goes to War. We pick up the tale where the previous episode The Almost People left off: Amy turns out to be pregnant and what we’ve been seeing so far this season was actually a Flesh ‘ganger. The real Amy is off on an asteroid giving birth to her daughter Melody Pond. 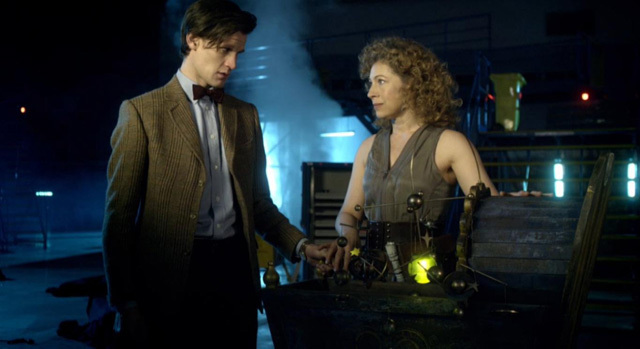 It doesn’t take a genius to see that name and make the connections to another noteworthy character – Melody is like a song, Pond is like a river, so that means Melody Pond is… RIVER SONG! Let’s be honest, we all saw that coming a mile off. We all predicted that River and Amy had some connection the moment we first heard Amy’s watery surname. Whether this affects the quality of the reveal or not is down to you, personally I think it still has the right impact. It’s like when you watch a detective series or read a mystery novel and manage to figure out the solution before the hero does; it doesn’t take anything away from the moment when the solution is revealed even if you had already figured it out. The thing is that almost every review you can find of this story will rip it apart because of this. And that’s totally unfair and misses the point entirely. The purpose of A Good Man Goes to War is to reveal that of course but there’s so much more to it than just the last few minutes. Moffat does so much more than just reveal River Song’s identity; he also devotes time to showing us the Doctor as a warrior before completely deconstructing the Doctor’s godlike arrogance that had crept in towards the end of the Davies era. In the first half of this story we don’t see the Doctor at all. What we get instead: him recruiting an army of trusted friends. We have Vastra, Jenny and Strax making their debut appearances, we have Dorium Maldovar and Captain Avery, Danny Boy shows up as well and there’s also an assortment of Judoon and Silurians. This is no nonsense stuff, the Doctor’s on the warpath and it’s terrifying to imagine being on the receiving end. Mixed in with the Doctor recruiting his army we have Madame Kovarian and her faction of the Silence preparing for battle. We have scenes where people talk him up as some sort of legendary figure as though he were a god. We have people build up this image of him as the ultimate warrior, and from what little of him we’ve seen in the story so far we can believe it. Moffat has set the scene nicely for one hell of a confrontation, building up more and more until finally when the Doctor shows up with the word “Surprise!” it all kicks off. But she’s wrong. In a brilliant twist we find out that baby Melody, having been conceived aboard the TARDIS in flight, is part Time Lord. Suddenly the events of Day of the Moon make sense! Another twist follows when Kovarian shows up again via video screen and has Melody with her. Amy is not with her baby but a Flesh duplicate. You don’t see that one coming! And then there’s the Headless Monks. These villains are oneof only two real negatives I have for this story, because of the wasted potential they offer. They are presented as mighty warriors that can and will destroy you for even the most minor of offences. Then they just turn out to stand around and wave laser swords in the air before being defeated by a man dressed as a Roman Centurion but with no actual combat skills, a Victorian inter-species lesbian couple (sigh) and a nurse. If you didn’t guess from my disappointed sigh a few moments ago, the other negative I have for this story lies with the characters of Vastra and Jenny. I have extremely mixed thoughts about these two and genuinely have no idea how I really feel about them. On the one hand I think they’re a brilliant double act that never fail to raise a smile. They can always be brought in to add entertainment value to a story (as we shall see in future stories like The Snowmen, The Crimson Horror or Deep Breath). Then there’s the fact that they provide a good representation of LGBT in a family show, this still being a couple of years before it became the “trendy” thing to do. That’s Doctor Who for you, being ahead of its time. I’ve got nothing against any of that. The problem for me lies with how ham-fisted it all is. Pretty much all the dialogue between the two of them either contributes to the narrative, such as revealing the baby’s ability to regenerate, or it consists of the two of them reminding everyone every five seconds about how they’re married. (How are they married? In 1888 it was still illegal and would remain that way until 2013, two years after this episode was broadcast. That’s Doctor Who ahead of its time once again.) I’m not being homophobic here; I just don’t see any reason why Moffat wanted to be so ham-fisted about it. Contrast to the RTD era when Davies would throw in off-hand references to such issues like the two old women from Gridlock or Sky Silvestry from Midnight. Nothing forced there, he just wrote it like it’s normal. Maybe since Russell T Davies is himself a gay man it comes more naturally to him than it does to a straight man like Steven Moffat? These are all minor issues though. If we can look past these problems and see this episode for what it is – a good story – we can let issues like ham-fistedness of Vastra & Jenny, the predictability of River’s reveal or the wasted potential of the Headless Monks and find loads to like. And there’s nothing that I like more in A Good Man Goes To War than Matt Smith. I’m putting it out there now; in terms of pure acting this is his best episode. His full range is on display and every side of the 11th Doctor is laid bare for us to see. He goes from an awkward schoolboy to a battle-scarred warrior to angry to joyful, he gives an epic speech, he has friends to comfort and enemies to defeat and one man’s life is utterly destroyed. It’s all there. One of my all time favourite Doctor moments is in the way he brings down Colonel Manton. The Doctor: Sorry Colonel Manton, I lied. Three minutes, forty-two seconds. 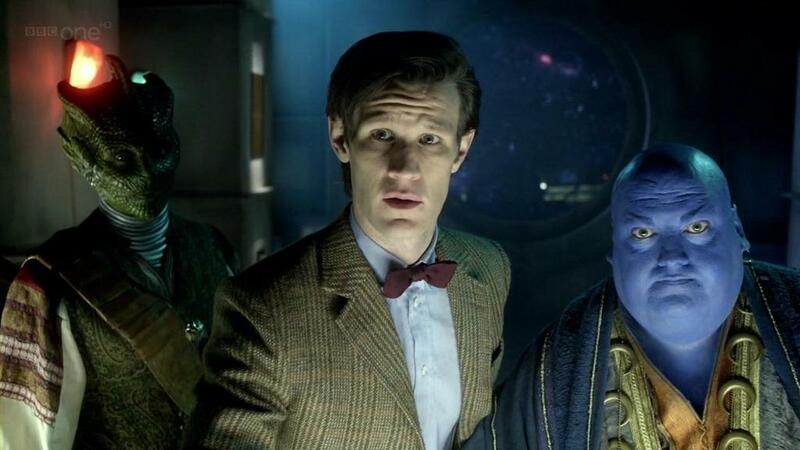 Commander Strax: Colonel Manton, you will give the order for your men to withdraw. The Doctor: No. Colonel Manton, I want you to tell your men to run away. The Doctor: Those words. “Run away.” I want you to be famous for those exact words. I want people to call you Colonel Runaway. I want children laughing outside your door, ’cause they’ve found the house of Colonel Runaway. And when people come to you and ask if trying to get to me through the people I love… is in any way a good idea, I want you to tell them your name. Look, I’m angry, that’s new. I’m really not sure what’s going to happen now. The Doctor: Good men don’t need rules. Today is not the day to find out why I have so many. So with intensity, humour and the best performance of Matt Smith’s career so far there is no reason why A Good Man Goes to War should be considered anything less than a triumph. It’s not perfect but it does come pretty damn close, and as a result it is one of my all time favourite Doctor Who stories. There's no reason why it shouldn't be one of yours as well. Watch it again today and I’m sure it will go up in your estimations.